Today in Masonic History we discuss the Acacia Tree. The Acacia tree is an important part of masonic lore. It is important to understand in any conversation about the "sprig of acacia", is that the term "acacia tree" is actually a generic term. Acacia tree actually refers to a genus of trees. 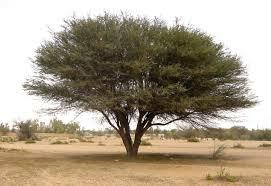 There are a wide variety of acacia trees in the world. Most grow in tropical and sub-tropical regions. There are more than 800 species and sub-species of acacia tree around the world. When talking about the acacia tree's relationship with Freemasonry we are most likely talking about the Acacia Raddiana which is a sub-species of Acacia tortilis. The Acacia Raddiana grows in Israel and is believed to be the wood that was used to build a variety of sacred items for the tabernacle. At least one of the items is believed to be the Ark of the Covenant. The Acacia Raddiana, because of the arid environment it grows in, grows very slowly and tends to be a very dense wood. The tree also produces small white flowers that are very aromatic. The "tree" can also grow as a small shrub particularly in rocky terrains. It is believed that the acacia tree first became associated with immortality due to an Egyptian myth about Osiris. In the legend Osiris is tricked into a box that is thrown into the Nile. It eventually washed ashore near an acacia tree which rapidly grew around the box. The tree was turned into a column by a local king, which Isis was eventually given.